TEMPE – End Violence Against Women (EVAW) International is recognizing ASU Police Chief Michael Thompson as the first Champion of Change for improving responses to sexual assault survivors and leading the ASU Police Department through a series of critical reforms designed to create a safe, victim-centered culture on campus. EVAW International recently announced the new Champions of Change program to honor individuals who work tirelessly to improve responses to victims of sexual assault and other forms of gender-based violence. Chief Thompson then led his agency to create a Special Victims Unit (SVU). ASU is one of only four universities in the nation with a SVU devoted to addressing sexual assault on campus. Detectives also investigate cases involving physical abuse, domestic violence, and crimes against children. Along with the new Unit, Chief Thompson established a position for a victim advocate who can offer free, confidential support for victims and witnesses of crime on any ASU campus, as well their family members. The agency also offers free self-defense courses for women and men, to reduce sexual violence and empower members of the ASU campus and surrounding communities. But Chief Thompson didn’t stop there. 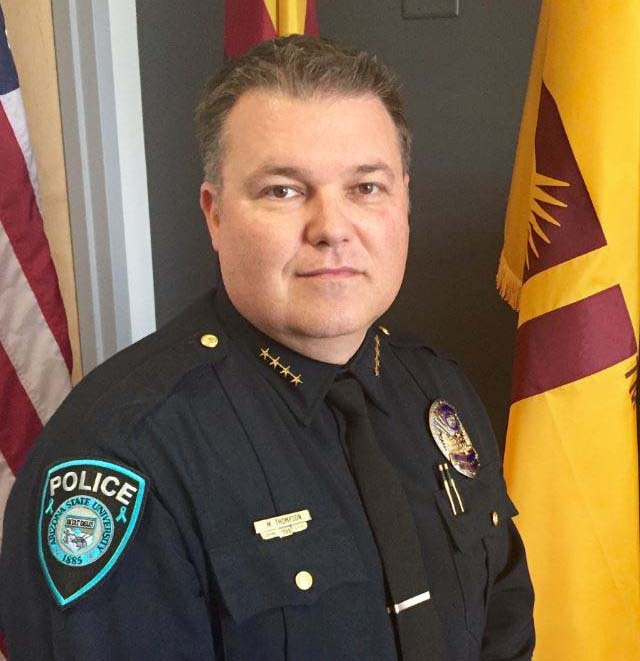 In 2016, he oversaw the redesign of the ASU Police Department’s interview room, as well as the waiting room, to be more comfortable for survivors and their loved ones. This involved new paint, as well as cozy, modern furniture, thanks to the Winged Hope Family Advocacy Foundation, Living Spaces, and Miss Arizona. Chief Thompson also places a premium on high-quality, professional responses for sexual assault victims and their support people. To ensure that his Department is fully capable of effectively responding to sexual assault, all of ASU’s officers, dispatchers, detectives, and the new victim advocate, receive training on sexual assault dynamics, victim impact, investigative strategies, interviewing techniques, and effective report writing. Yet the agency’s latest initiative may be the most innovative. 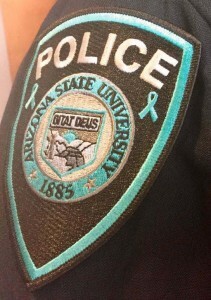 In a first-of-its-kind effort, all officers with the ASU Police Department will wear a limited edition, teal-colored patch on their uniforms during the month of April, to commemorate Sexual Assault Awareness Month. This will take place in conjunction with other efforts to raise awareness about sexual assault and enhance support for survivors. A limited number of the patches are available for a $5 donation, and all proceeds will be given to the Winged Hope Family Advocacy Foundation. There is no doubt this program will spark conversations with ASU officers and others, about sexual assault response, recovery, and prevention. We hope other agencies will follow their lead. The ASU Police Department mission is to enhance the quality of life by providing a safe and secure environment through professional and proactive law enforcement services in partnership with the University community.